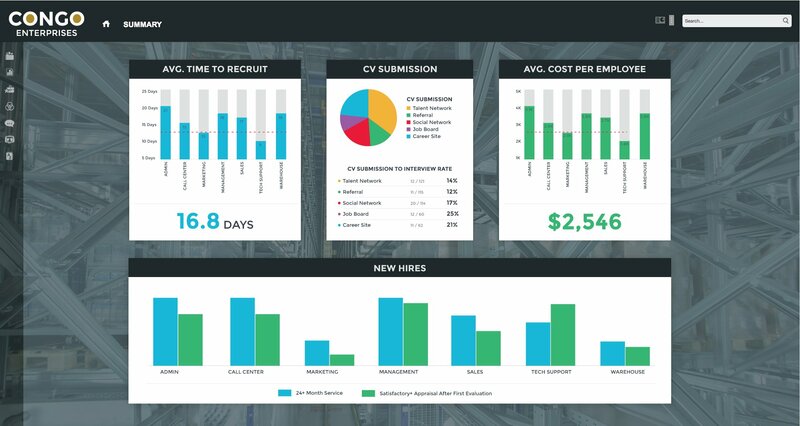 It’s an innovative business analytics accelerator platform that delivers a unique combination of web and mobile self-service analytics, user experience, advanced portal functionality, and integrated capabilities across multiple analytic platforms, apps, content, and communities. 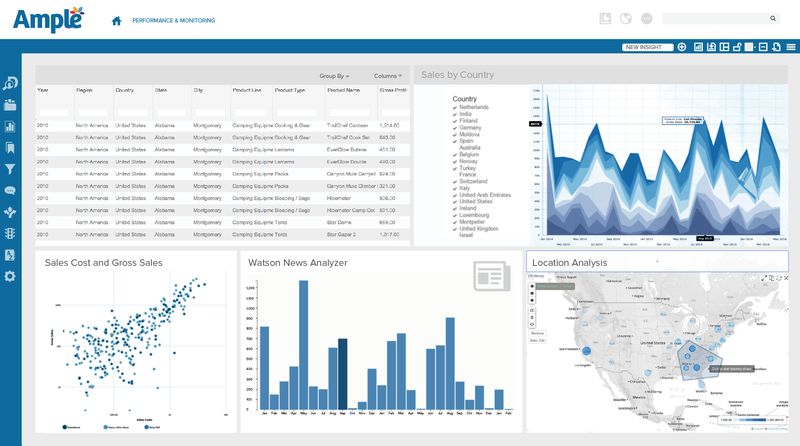 Streamline the development, deployment, and management of web and mobile analytic applications by leveraging Cognos BI, IBM Planning Analytics Local (TM1), SPSS, Watson Analytics, ILOG and other industry leading platforms. 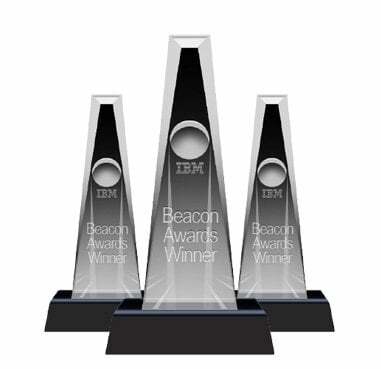 Deliver enhanced consumption of highly integrated analytic solutions without coding or programming. Brand, style, and tailor the user experience including the interface layout, graphics, features, and content by organization, department, user type, individual, or business requirement. 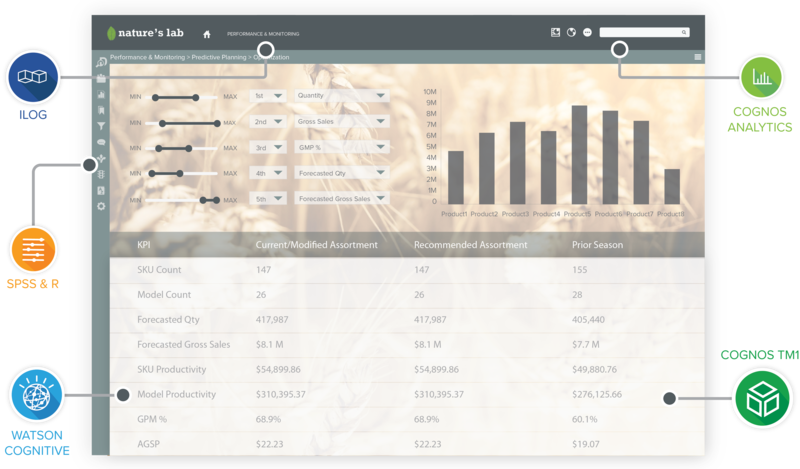 Capabilities including streamlined navigation, filters, smart search, bookmarks, snapshots, collaboration, guided analytics, alerts, business glossary and many more allow users to harness the power of the analytics through improved function, use, visual appeal, and adoption. 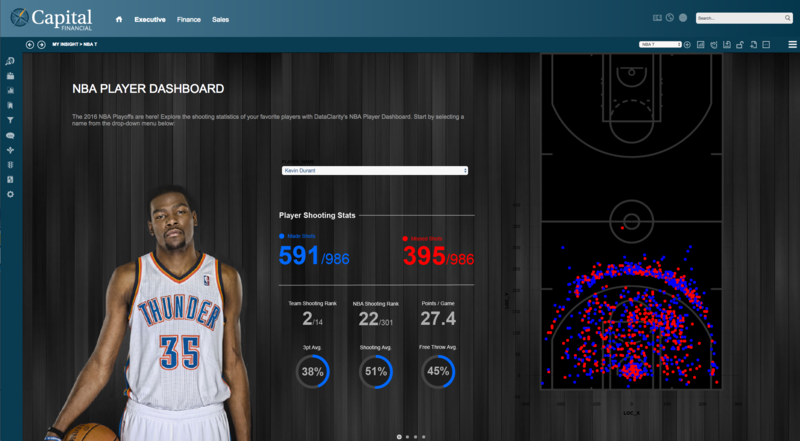 Users can discover and blend data, and author and assemble content with stunning interactive charts and maps. 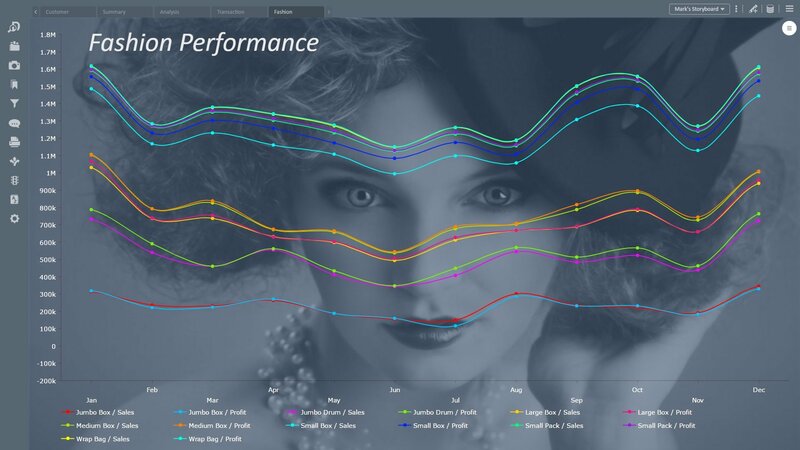 Author through an intuitive drag-and-drop interface with smart visualizations to gain better insight, spot trends and patterns, and tell a compelling story. 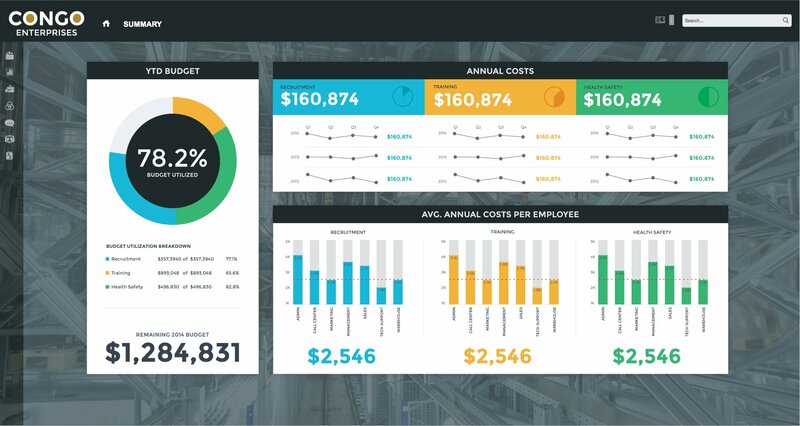 All users can easily author advanced reports with SmartBusiness Visualizations optimized for different business needs, analytical approaches, and data sets. 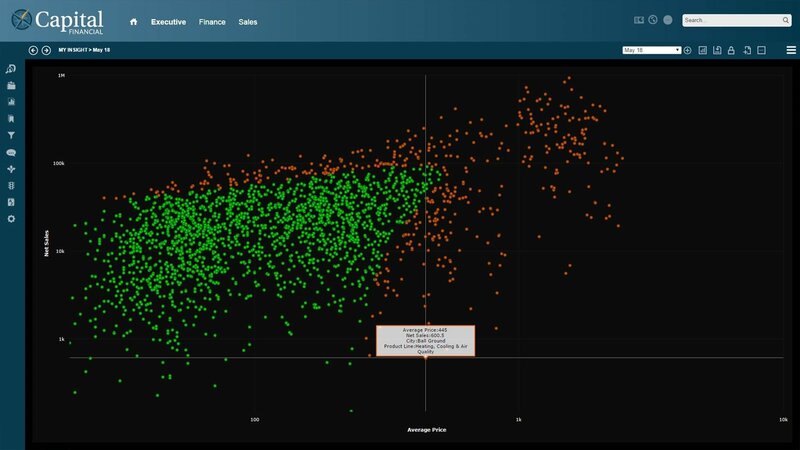 A built-in recommendation engine provides suggestions for visualizations that fit your data and requirements, and make analysis fast and simple. Improve productivity, and drive faster and smarter decision-making through a collaborative online environment that ensures a single view of information and keeps all team members working in sync by tracking all discussions, content, views, and decisions in one place. 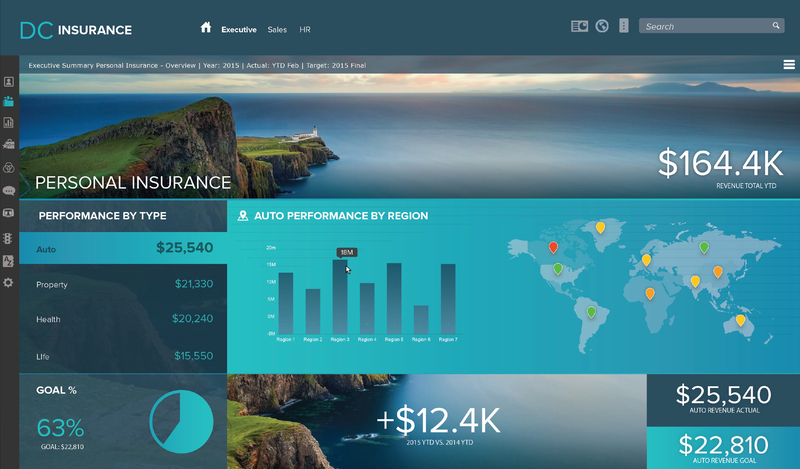 Quickly deliver forward-looking insight through powerful and interactive dashboards that employ what-if scenario analysis and sophisticated predictive models enabling users to seize opportunities, reduce risks, and optimize future outcomes. 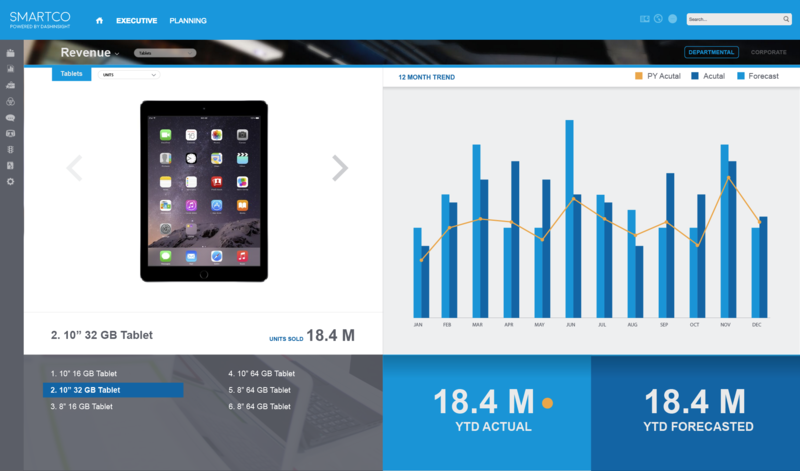 Highly visual easy-to-use native iPad, iPhone, and Android applications that synchronize all content with DashInsight™ on your desktop, and require no re-authoring of your reports, dashboards, and KPI’s. Rapidly deploy with flexible on premise, cloud, or hybrid configurations that fit your specific business, technical, staffing, and budgetary requirements, and accelerate time to value. Arm users with Designer, Studio and Administrator tools to provide a fast and easy way to create, configure, deploy, and manage applications, portals, features, content, and users’ communities. 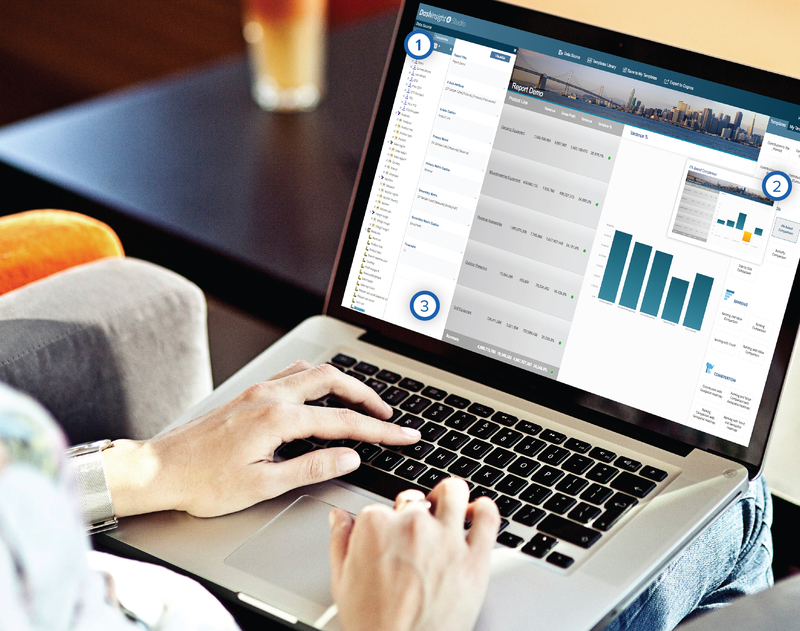 From one end to the other, your custom DashInsight interface features MyInsight, Content, Snapshots, Bookmarks, Filters, Collaboration, Guided Analytics, Alerts, Business Glossary, Tools, Search, Publishing, and Export. 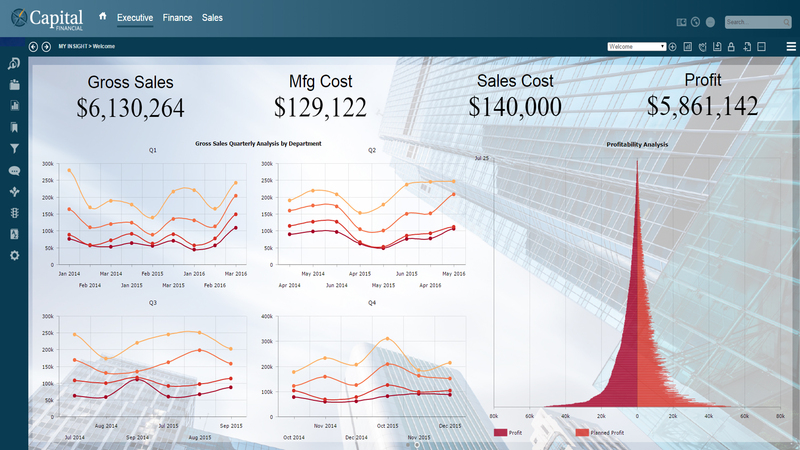 Allows business users to create personalized dashboard views and storyboards that meet their unique requirements by performing data discovery, blending, authoring, and assembly in one intuitive process. 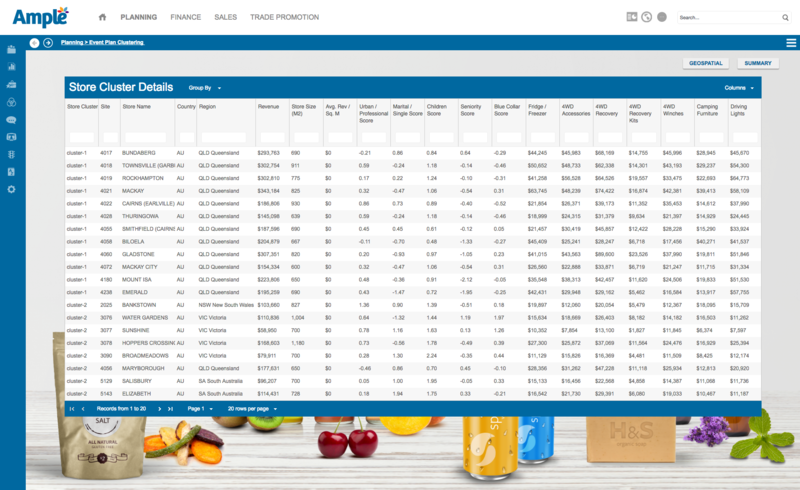 Provides users with easy access to reports and other content from a Windows style expandable menu tree and folder structure for faster data exploration and analysis. Enable users to save a report as of a specific point in time, and stamp it with a unique name and time/date for future reference. Allow users to save filtered views of a report with a unique name, and group them in folders with either public or private access. Allow users to explore data and query relevant content that answers their business requirement through the application of smart global report prompts that are persistent when navigating to other content. Facilitates user communication and information sharing through multi-threaded discussions containing live and bookmarked reports, snapshots, other content, and to-do items. Empowers users to find business answers by guiding them through a hierarchy of business questions to identify the relevant reports. 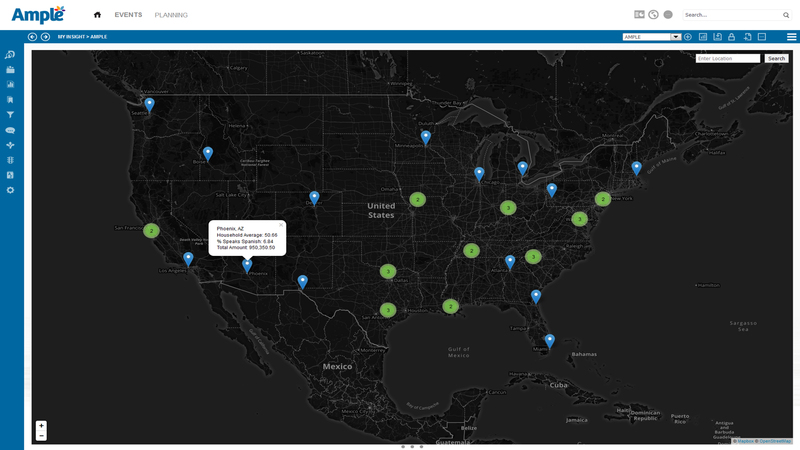 Provides notification and real-time access to critical information events. Users can be notified within the interface and through e-mail, and obtain detailed information through the alerts panel. 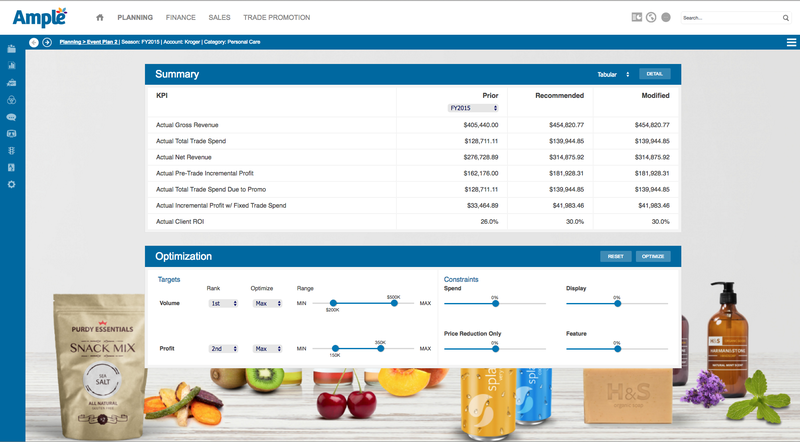 Provides users quick and easy access to business terms, definitions, and other descriptive information regarding their reports, KPI’s, and other content. Enable power users fast access to advanced authoring and development tools within the user interface based upon their role and permissions. Allows business users to intelligently search and explore all metadata or the most relevant business information across all content. Allows users to create Microsoft PowerPoint, Apple Keynote and Adobe PDF presentations and booklets containing reports and other content through a simple step-by-step wizard. Provides users a simple way to export reports, dashboards and other content to Microsoft Excel or Adobe PDF formats, or through e-mail. 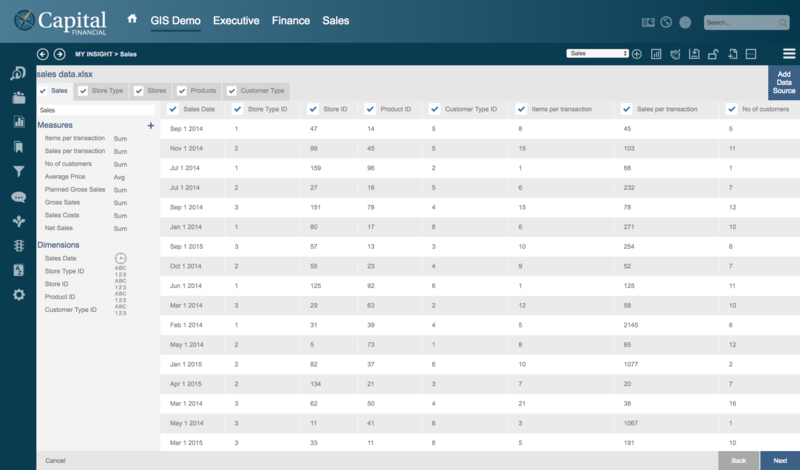 Business users upload their own datasets which are automatically processed by the MyInsight parsing and profiling engine. This engine separates the measures and dimensions for each dataset and allows users to modify the aggregation type on a given measure. Users can also rename or exclude any column or even an entire dataset simply by checking or unchecking the corresponding box. 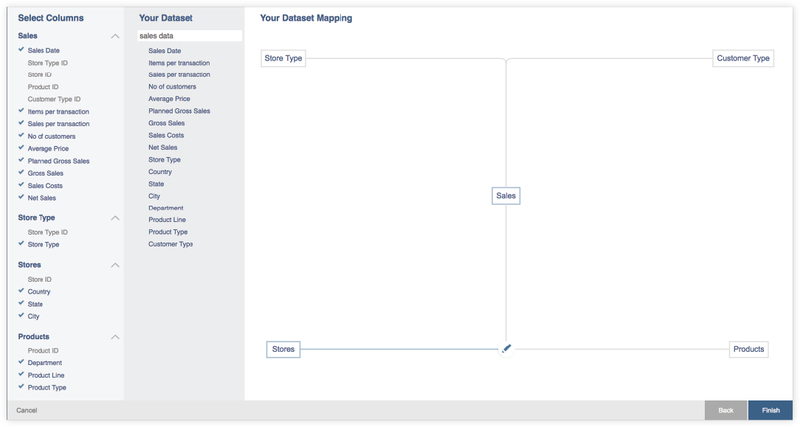 DashInsight automatically recommends measures and dimensions to be included in the dataset, as well as the data relationship between the fields with the same name and data type. Users can also manually create custom relationships, and select the measures and dimensions that will be included in the final dataset. 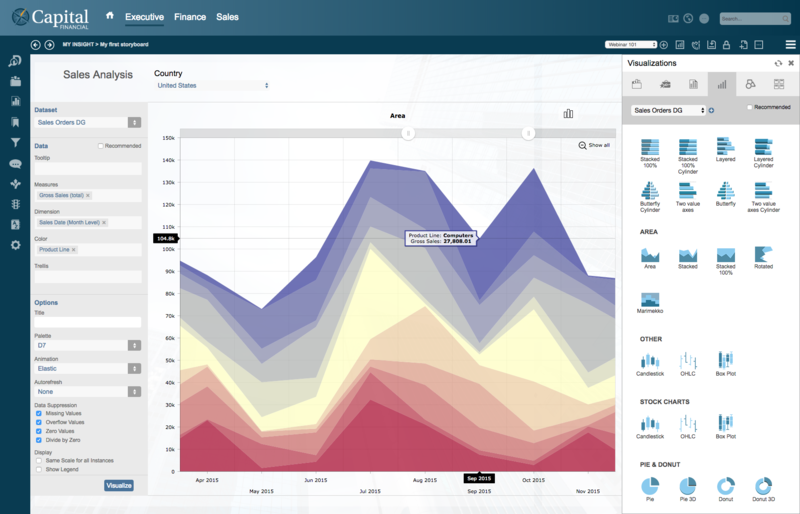 Empower users to discover & automatically model data, author & assemble content with stunning visualizations. 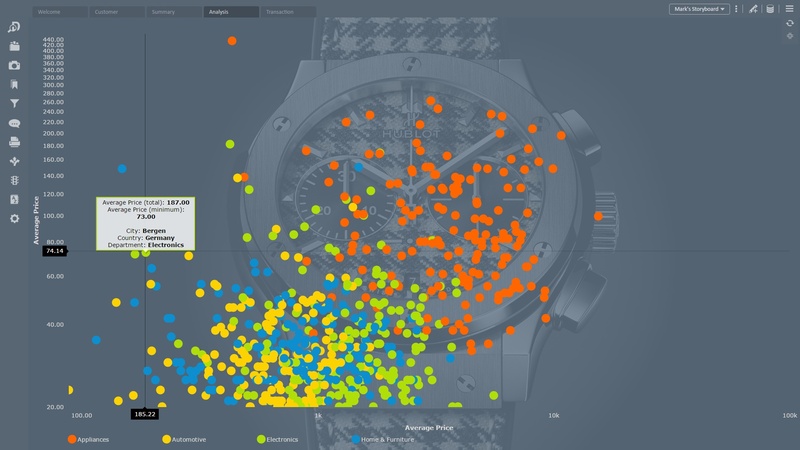 Users can drag and drop visualizations, select a dataset and recommended options from the configuration panel, and press the Visualize button to author content. 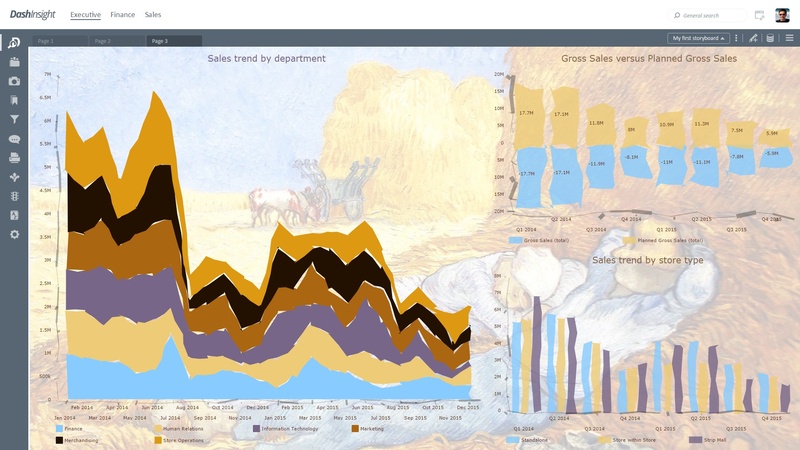 Easily discover and create new insights with numerous visualizations, content, widgets, and pictograms, using multiple pages, layouts, colors, exporting and sharing options. 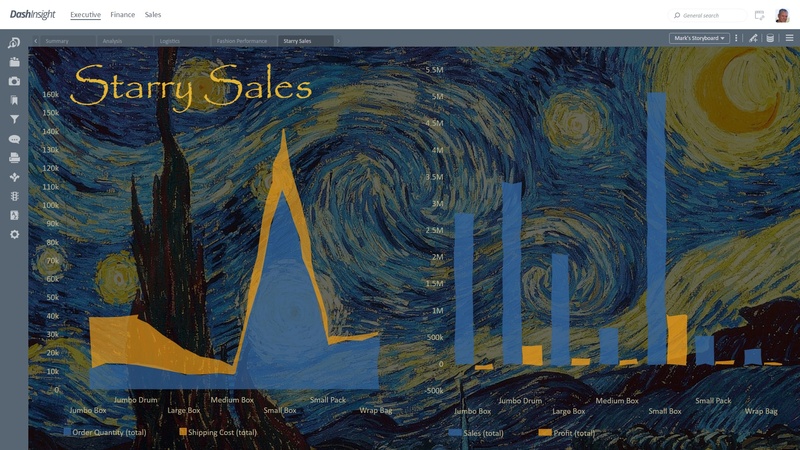 Become a story teller by assembling multi-page storyboards using an intuitive drag and drop interface to add and configure visualizations, content, widgets, and infographics. 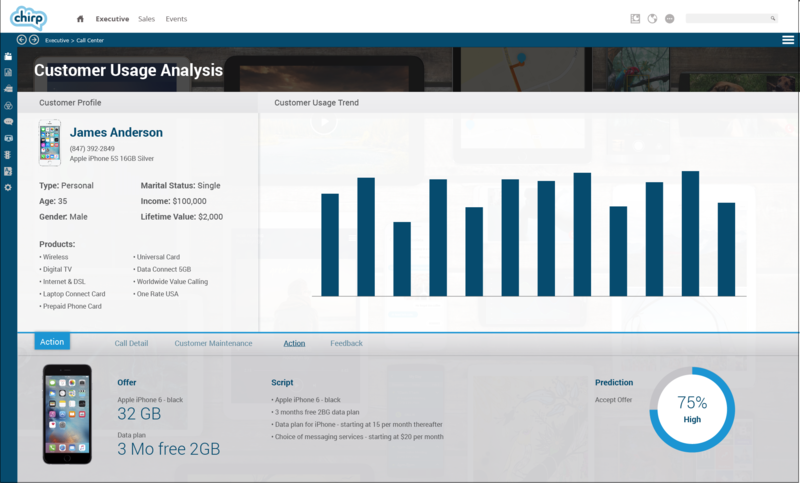 Users can quickly add new MyInsight capabilities by downloading new visualizations, content, and widgets on demand from the DataClarity SmartBusiness Cloud. 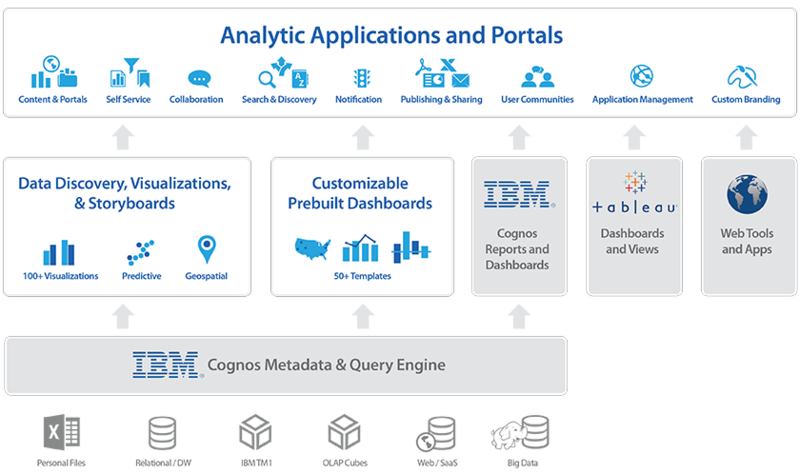 DashInsight™ brings together Cognos Analytics, IBM Planning Analytics Local (TM1), SPSS, Watson Cognitive, ILOG & other industry leading platforms in a fully-integrated architecture & user experience that streamlines the development, deployment & management of web & mobile analytic applications. The predictive engines that power advanced analytic capabilities including forecasting, optimization, and recommendations. 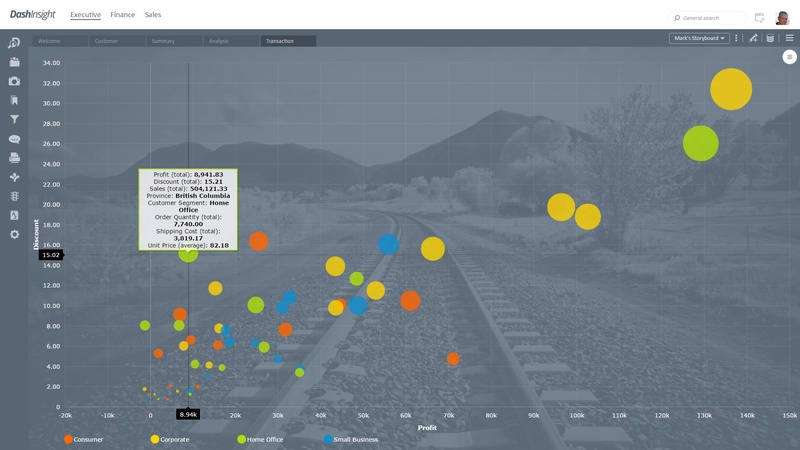 The in-memory analytic OLAP engine for analysis and scenario planning. 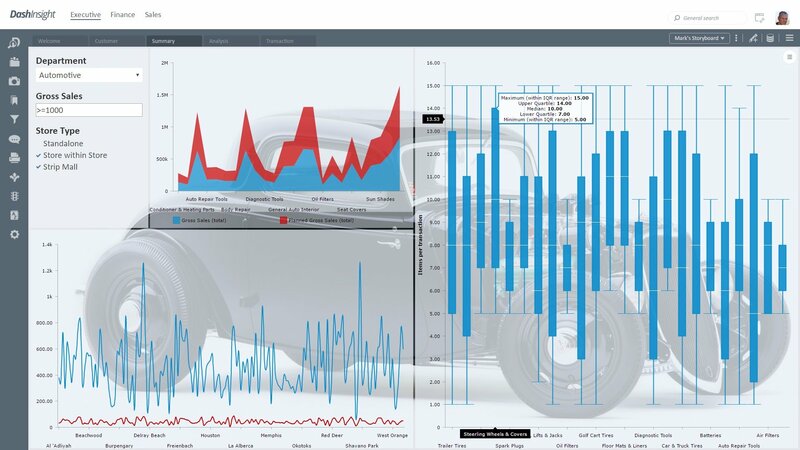 The visualization engine for rendering high definition dashboards, reports, and other content. 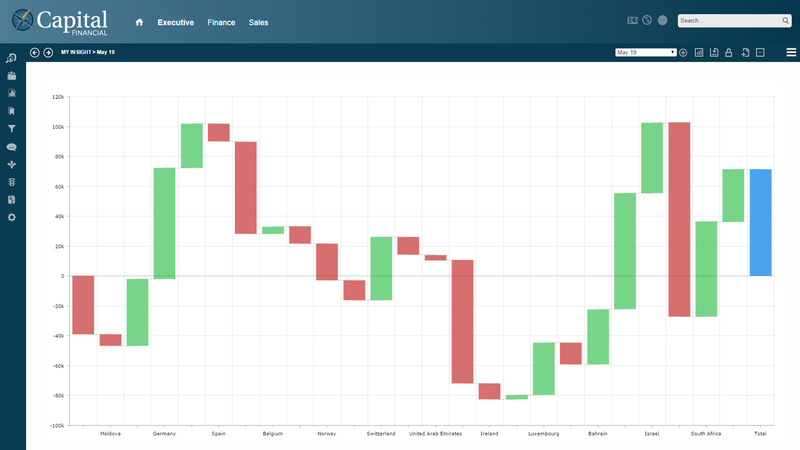 The web-based service that business professionals of practically any industry and skill level can use to instantly access and use predictive and visual analytic tools. 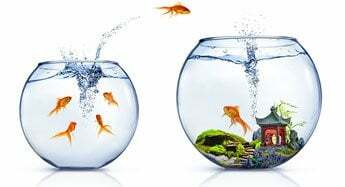 An analytical decision support platform for rapid development and deployment of optimization models using mathematical and constraint programming. 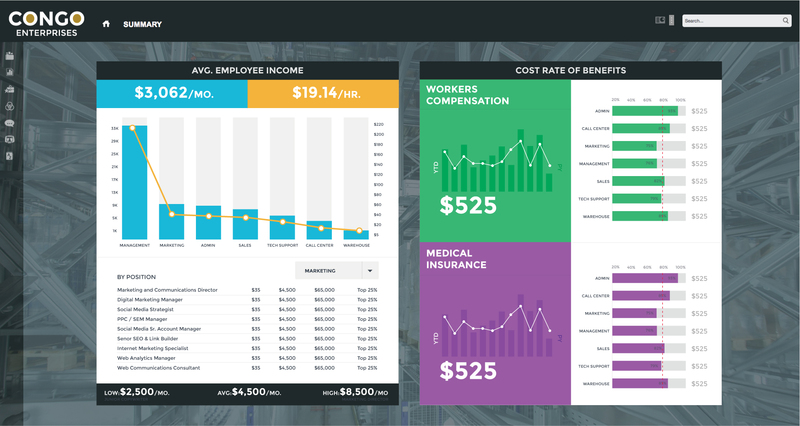 The primary application layer that provides a rich easy-to-use customizable user experience for visualizing and interacting with summary and detailed views. 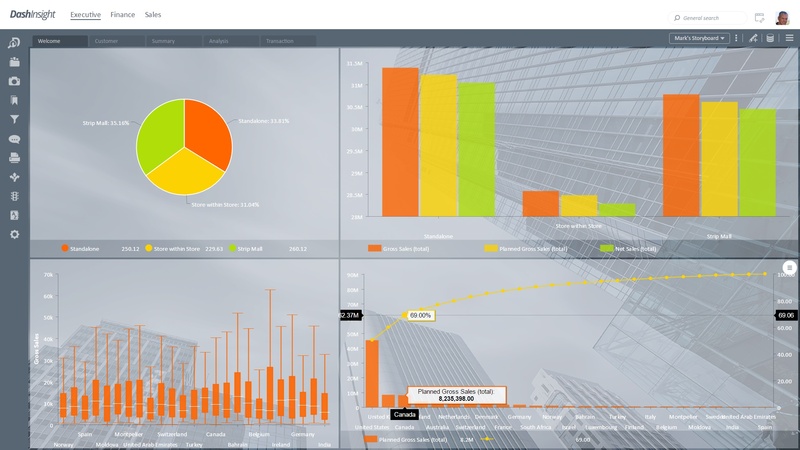 DashInsight is an innovative, easy to use accelerator platform to build and deploy powerful fully-integrated business analytic applications in three simple steps. 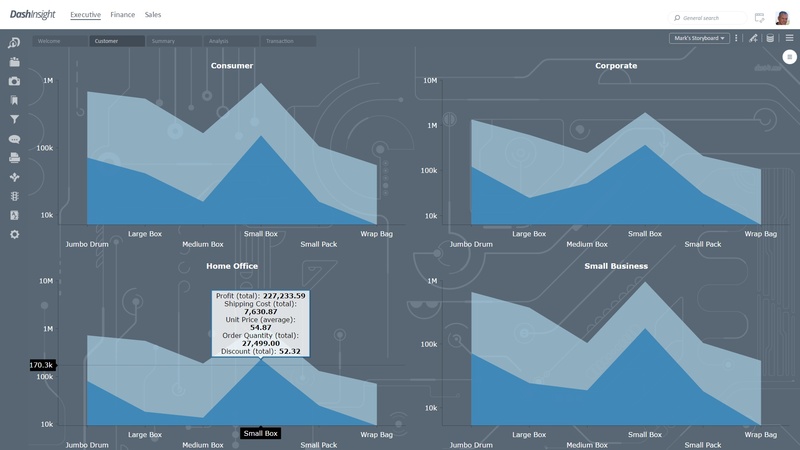 In three steps, rapidly create, customize, and deploy dashboards using powerful drag & drop visualizations from a rich template library. 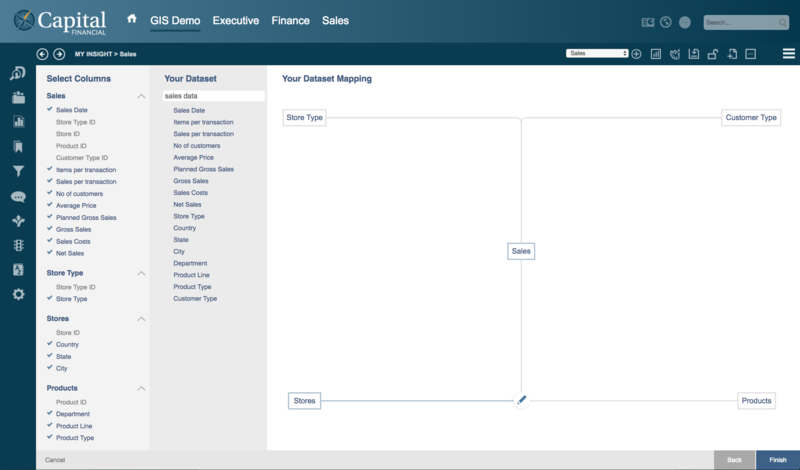 Create, deploy & manage business applications, content & user communities with powerful design & administration tools. 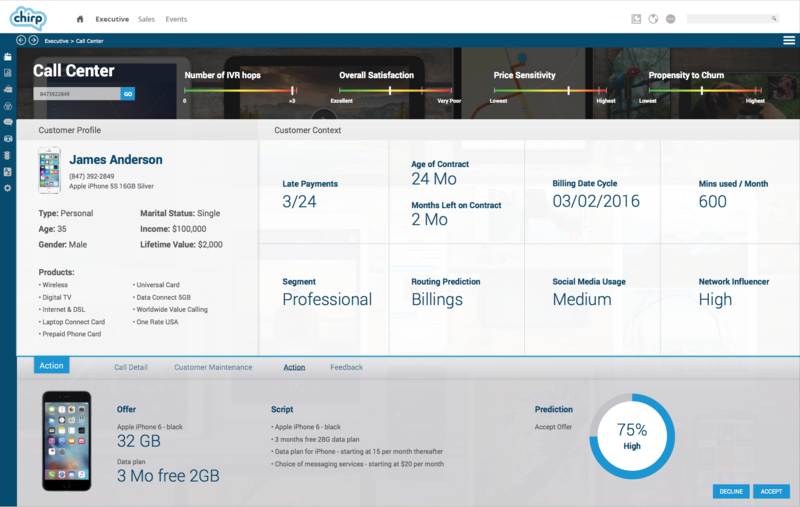 Rapidly create, publish and manage applications including themes, features, and content. 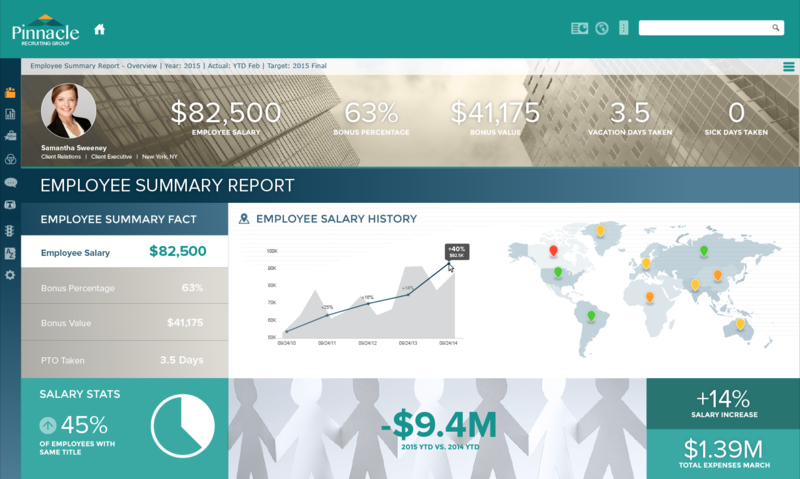 Create and deploy custom layouts, graphics, and other content that best reflects your company style and brand. Create and manage user communities including user settings, security/access rights, and other preferences or role-based requirements. 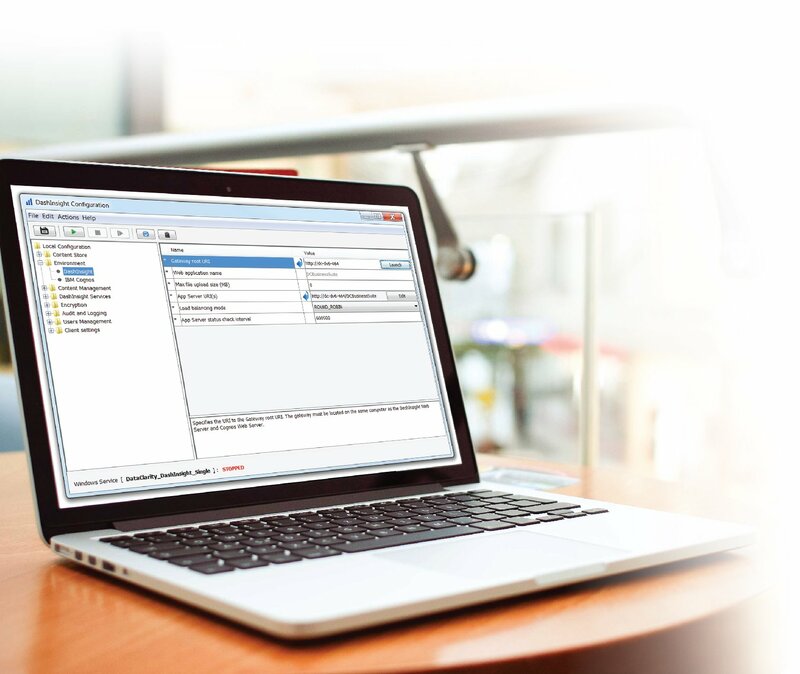 DashInsight Configuration Client is an easy to use application client to configure and validate the system preferences, such as server URLs, ports, content store database connections, log settings, notifications, as well as start and stop DashInsight services. DashInsight is built on a web-based service oriented (SOA) architecture that is designed for scalability, availability, and customization. 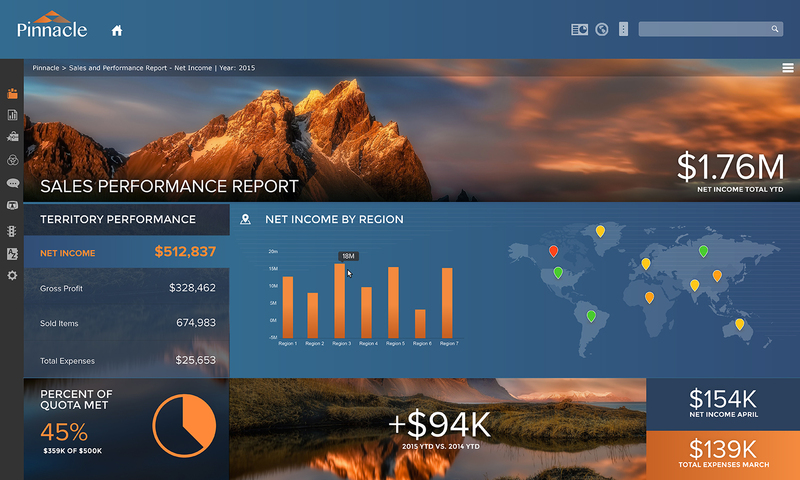 DashInsight architecture features a consistent, zero footprint, Web-based user interface for viewing, creating, and administering business portals and user communities. It also provides a single point of administration, as well easy to access and use Web-based management components. 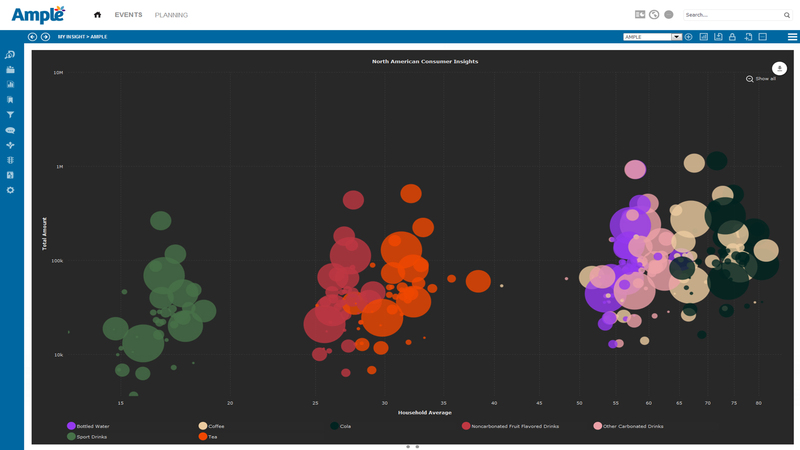 DashInsight fully integrates with and leverages existing IBM Cognos BI, IBM Planning Analytics Local (TM1), IBM SPSS, IBM ILOG, IBM Watson Cognitive content and capabilities. 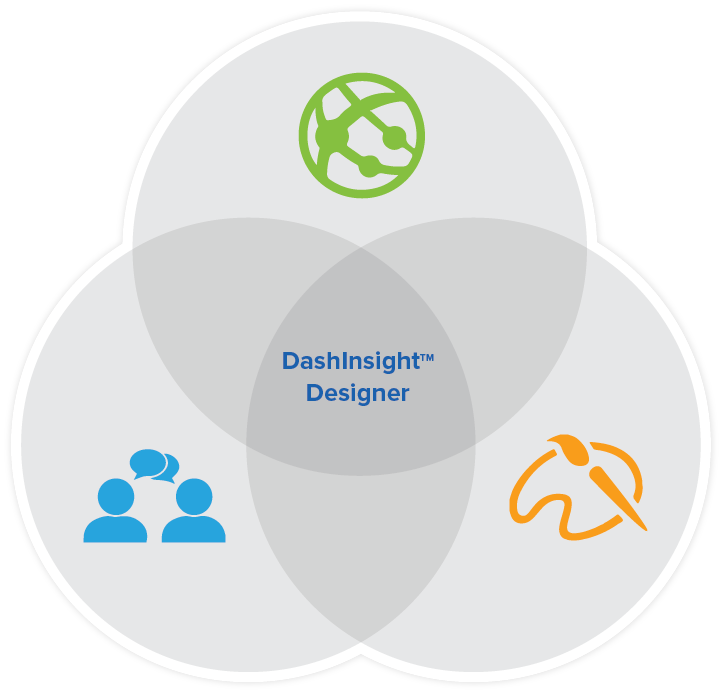 DashInsight has a multi-tier architecture that includes gateway, app server, and data. DashInsight also supports dynamic load balancing and failover recovery. 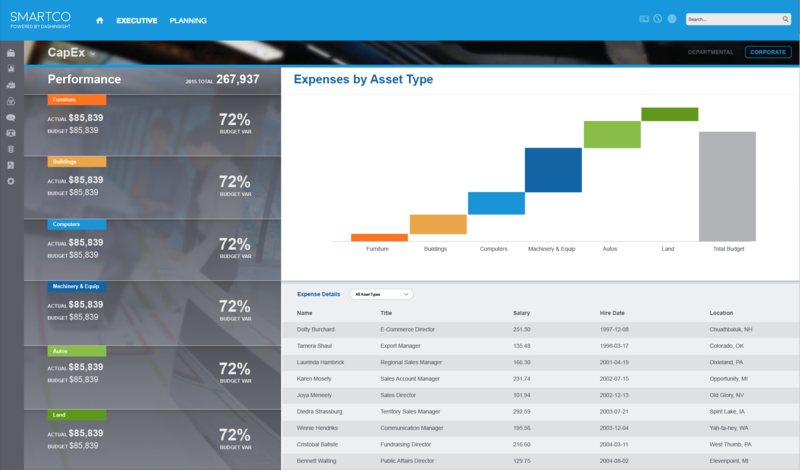 Contact us today to learn how DashInsight can be tailored to meet your particular requirements. We would be delighted to consult with you and make specific recommendations.